The paint may be peeling in places and it has clearly seen better days, but to its proud owner, the gunmetal-grey Sea Harrier remains a thing of beauty. The British-built jet, once a potent symbol of this country’s technological prowess, now startles the neighbours and the local Cessna pilots whenever it emerges from its hangar at the tiny St Mary’s County Regional Airport in Maryland, some 50 miles south-east of Washington, DC. 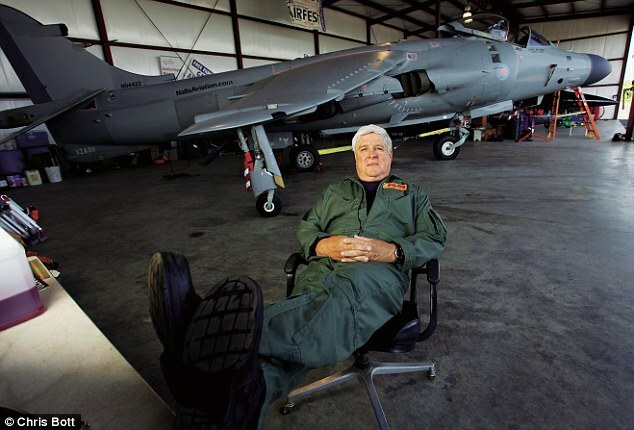 ‘When people see it in flight it inspires awe,’ booms Art Nalls, the only person in the world to privately own a working Harrier jump jet. ‘People can’t believe ten tons of aluminium can float motionless on a sea of noise. I get a kick out of watching the crowds at air shows. 'As soon as I gun the engine, people put down their hot dogs and look upwards with their mouths wide open, like a bunch of baby birds waiting to be fed. It’s 30 years since the Harrier’s finest hour, when it helped us win the Falklands War. The aircraft entered service in 1969, but it was in the South Atlantic in 1982 that it came into its own. The Argentines nicknamed it La Muerte Negra – the Black Death. During the conflict Harriers shot down at least 20 Argentine planes without a single loss in aerial combat (ten were lost to ground fire, accidents or mechanical failure). With its superior manoeuvrability and armaments – including the latest AIM-9L Sidewinder missiles and Blue Fox radar – the British jet outclassed the enemy Mirage III and Dagger aircraft, even though the Argentine planes were considerably faster. It went on to see action in both the Gulf War and the Iraq War, as well as in Bosnia, Kosovo, Sierra Leone and Afghanistan. But since then its star has faded. The UK Government caused widespread outrage in October 2010 when it announced it was axing our remaining Harriers as part of the Strategic Defence Review. ‘Betrayal – that is the only word to describe our emotions,’ remarked one pilot at the time. The entire fleet of 74 aircraft (minus two allocated to museums) has since been bought by the U.S. – whose Marines still fly the Harrier regularly in Afghanistan – in a deal worth around £115 million. Admiral Lord West, who was head of the Navy from 2002 to 2006, spearheaded an unsuccessful campaign begging the Prime Minister to reconsider his ‘bonkers’ decision to scrap the iconic aircraft. In an open letter to David Cameron, he wrote that the PM was a ‘victim of bad and biased briefing’. What most angered the Harrier pilots was the belief that their aircraft was better suited to combat operations in Afghanistan than the Tornado, which is almost as old yet has survived the defence cuts relatively unscathed. Following the Government’s announcement, one senior Harrier pilot said, ‘We have been under relentless pressure from an Air Force system that simply wanted us to fail. 'There is absolutely no doubt that the RAF has been working against us from the start of the whole process. This is all about service politics rather than making decisions based on the suitability of the aircraft for this particular combat environment. 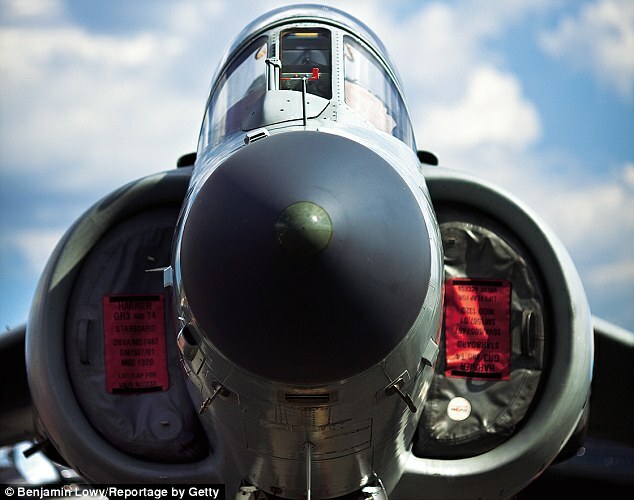 It was an ignoble end for an aircraft that was once the pride of Britain’s armed forces, and one which has left Nalls, a retired U.S. Marine colonel, as the self-described ‘defender’ of the Harrier’s legacy. The irony isn’t lost on the patriotic American. Nalls, who lives in Virginia, won’t divulge exactly what he paid for his ‘bird’, but says reports of £2.5 million ‘are not wide of the mark’. Staggeringly, it costs £150 a minute to fly. ‘It’s the ultimate boys’ toy,’ says Nalls, who made his fortune in property development after retiring from the Marines due to an ear injury. ‘What makes the Harrier unique is its ability to take off vertically, hover on a dime, fly backwards and pirouette like a dancer in the air. That made it deadly in combat and thrilling to watch. Nalls’s love affair with the plane began during his days as a Marine pilot. ‘I flew 65 different types of aircraft. I was less than enthused when I was chosen to fly the AV-8A Harrier. It had a horrible reputation as a difficult and busy aircraft. 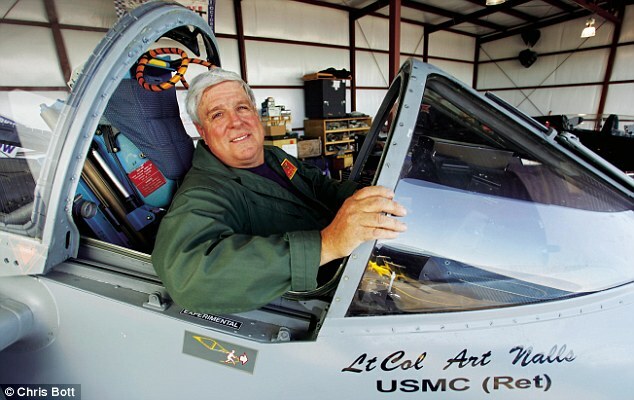 He went on to work as a test pilot at Edwards Air Force Base, where one of his jobs was to take Harriers to 45,000ft and shut down the engine. ‘I have more than six hours of flight time in single-engine jets without the engine running,’ he grins. After retiring in 1989 due to an injury sustained when he broke up a bar-room brawl, Nalls began investing in property and built a multimillion-pound empire. He started buying planes – a Russian Yak-3 fighter and a Czech L-39 Albatros. Then in 2006 he learned that the RAF was selling an FA2 Sea Harrier (or SHAR) via an aviation broker near Ipswich, Everett Aero. ‘The plane was due to be retired. She never flew in combat; she was used to train pilots. I think the broker expected her to end up in a museum. Owning a Sea Harrier was one of my life’s dreams. Once he’d obtained clearance from the authorities, the Harrier was transported to Maryland by sea. ‘I had to go through a mountain of red tape to get her over to the U.S, and she arrived in pieces. Then began the arduous process of making the plane airworthy again. ‘The weapons systems had been removed and we replaced some of the heavy radio equipment and wiring. It was a labour of love. I had a team of volunteers and we worked around the clock for two years before I took her up in the air for the first time. The lowest point came after the plane had been reassembled, at the end of its second flight. But Nalls says the effort was worth it. ‘The first time I took her up was magical. There is something poetic about the quality of the engineering. This plane can roll, climb, dive and turn, but what’s staggering is how you can go from travelling through the air at 600mph to hovering at a standstill in a matter of seconds. It’s an expensive habit, though. Nalls has spent more than £1 million getting the plane back in the air – and its Rolls-Royce engine guzzles one gallon of fuel every six seconds. ‘I use up 50 gallons of fuel just getting from the hangar to the runway. At the beginning I was fuelling up so often the local aviation authorities got on to me wanting to know why I required so much jet fuel. When I told them it was for my Harrier, there was silence at the end of the phone. ‘I’ve had her long enough now that word has got around. The world of air shows and those of us who own private jets is pretty small, and once I got the SHAR the news spread like wildfire. 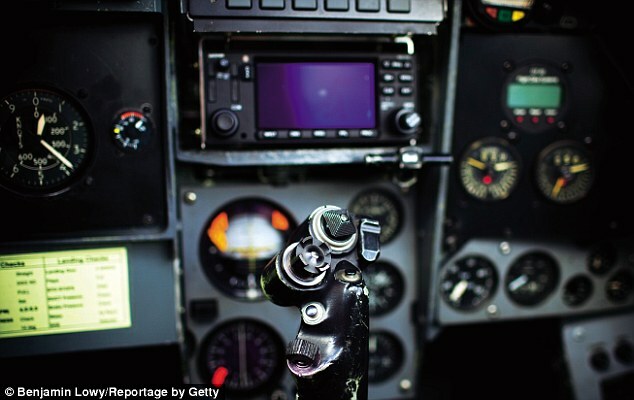 The jet’s controls include a conventional centre stick and left-hand throttle, but with the addition of a lever for controlling the four vectoring nozzles – pointed backwards for horizontal flight and downwards for vertical take-offs and landings. Otherwise, the cockpit is unremarkable. 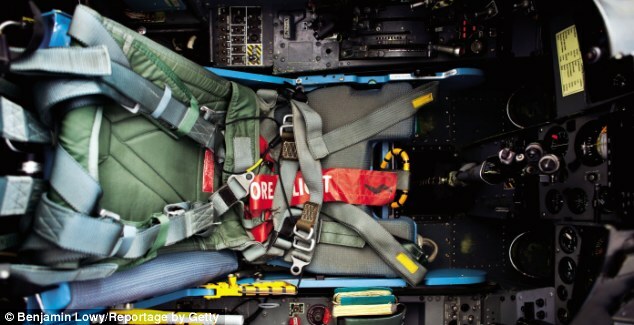 ‘There are no mod cons in the aircraft – no cup-holders in the SHAR! This is a performance plane,’ says Nalls proudly. ‘I’m the only guy in the world with my own Harrier, and I intend to enjoy it just as long as I can. I would love to bring her back to the UK in 2012 to help celebrate the 30th anniversary of the Falklands War. As an American with an affinity for history, I feel true sympathy for my friends in the United Kingdom. Your government has bankrupted you and disregarded your history in countless ways, and have steadily disarmed the citizenry over the last few decades. If only it were that the brave and mighty men and women of England's armed forces were the ones calling the shots in your government instead of your inept socialist polticians. You fight and have fought with valor and courage alongside us, and our superb special forces (Delta, SEALs, Rangers, etc.) owe a massive debt to the amazing people in your Special Air Service and Royal Commandos for their very existence. That a morally bankrupt socialist system was able to sneak in and, bit by bit, consume the legacy one of the greatest countries in world history is nothing short of an outrage. Best of luck in getting your country back. I feel much greater affinity with the United States, who helped us so much, than with our own politicians. Thank you, Art Nalls, for keeping one of our Harriers flying. More power to your elbow! Martin, Dubai, 2/1/2012 0:51 What exactly have you corrected me about? Your comment doesn't seem to relate to any of mine. The sale of the Harriers along with our aircraft carriers is the pinnacle of Scameron's betrayal of the UK & the British military! The wholesale decimation of the armed forces is unprecedented and has been forced by Scameron & co's deep seated love of the EU and the soon to be imposed European Defence Force. An accident led him to deploy the veto and the sheep who follow him do not understand that this will soon be reversed. If anyone thought that Tony Bliar was the ultimate traitor, to borrow a quote, "they ain't seen nothin yet!" Luckily for us, the EU & the fantasy currency will implode quite soon, it is doubtful that Scameron and his cadre of fools will last much longer. There must be someone, somewhere that can stop this ongoing nonsense. If it could be harnessed, we could probably power the whole country from the rotations of a certain Winston Churchill who must surely be spinning in his grave. It's amazing, isn't it, when you consider how many people aren't even able to assemble their own newly acquired flat-pack wardrobes, that there are others, like Col Nalls, who have the nous for this kind of project. Awesome. Awful fuel bill, though. As a kid I loved watching the Harrier, so graceful, so powerful and an awesome adversary in combat. What is wrong with our treasonous, brainless and inept government ?? 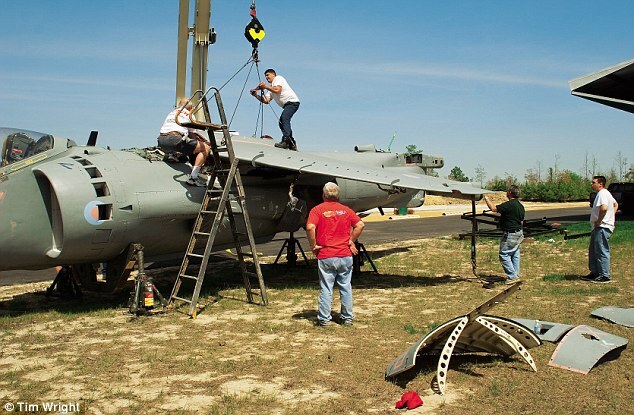 When they scrapped the Harrier they KILLED a part of our history, a part of our heritage and culture. God, I hate politicians - hope they rot for what they have done . . .
... its Rolls-Royce engine guzzles one gallon of fuel every six seconds ......................................................................................................................................................................................................... THAT in itself is a very good reason for scrapping these irreponsible behomeths which neither the taxpayer nor the world's dwindlng resources should be forced to support. What is it that politicians don't get? We are an island nation, we need a Navy, we need a Fleet Air arm, the RAF is only of any value if it can be deployed from friendly land bases set up in other countries to reach the theatre of war. The Fleet Air Arm can be deployed to virtually any theatre of war and still remain in international waters if need be. We need the Submarines, we need the Frigates, we need the Destroyers, we need the Minesweepers, we need the Aircraft Carriers. We don't need the RAF as the Fleet Airarm pilots are far superior aviators any day, and if necessary could use the same land bases as the RAF would. Slim down the RAF and build up the Royal Navy and use a much more versatile force to do the job. In short the Navy can do what the RAF do but much better and from anywhere in the world including the middle of the ocean. The RAF are landlocked. While this long-awaited sequel isn't quite the masterpiece it could have been, there's still plenty here for strategy fans to enjoy, especially the brilliant Theatre of War mode. Deep Silver has brought outright craziness with Saints Row IV. In this preview build players take control of the protagonist, who happens to be the President of the United States. Drive Club is very fun. It's just not very pretty. In fact, for one of the PS4's launch line-up, it's hard to see anything 'next gen' about its visuals. It must get better. He may have lost his Australian accent, but that didn’t stop Mad Max from generating a buzz at this year’s E3 conference. It's made by the team behind Just Cause. It was the prettiest game of this year’s E3 convention… and it’s not even next gen. But don’t let its playful visuals fool you, because Puppeteer’s plot is rather dark. There are not enough words or pages on the internet to describe just how good The Last of Us is. You simply have to play this stunning video game. For five years, gamers have been itching to get behind the wheel of another GRID game. Although DIRT: Showdown was a dead end, Codemasters are back to form. He may not be the best-known comic book character but Deadpool is shaping up to be one of the most memorable and controversial games on current gen this year. This is two games in one. One average. One great. For console owners or those with aging PCs, it falls into the former category. But it's a must-buy for a top-end PC. MARTIN SAMUEL: Let football's State of Origin game begin! It's North versus South in a game for pride... but who would feature in your XIs? Brighton set to appoint Garcia as man to replace Poyet... but what do you know about the former Barcelona star? McIlroy hoping to end barren run back on home soil at Irish Open... but there could be rough times ahead judging by Shevchenko! ROSS HUTCHINS: Murray to ease through... our other struggling Brits aren't used to playing at this level... and why can't the top players stop falling over? Gaming headsets can be costly. And at £69.99, the Ear Force PX22 comes in at the cheaper end of the spectrum. Thankfully, its sound still packs a solid punch. The Philips Downtown CitiScape headphones look stylish and don't disappoint on the audio front either. They make an excellent commute companion. The UP wristband by Jawbone promises a lot. It takes a 'holistic approach to a healthy lifestyle' to 'keep you moving forward'. It tracks sleep, food and movement. MailOnline reviews wireless speaker systems to find out which one should soundtrack your summer. Best on show was Jawbone's Big Jambox. Once at the top of the mobile phone market, US firm Motorola has been fairly quiet on the handset front over the past few years. But now they're back with bang. Whilst a 10” tablet would usually set consumers back at least £300, Gemini’s 10” tablet comes in at half that price at a very affordable £149.99. It packs a punch, too. You won't want to open the P3 headphones. For the packaging is so elegant, it feels like you're ruining a piece of art. Yet that's the best way to describe the P3s...art. Sports headphones are a tricky proposition for manufacturers, but Jabra make a decent fist of it with this wireless Bluetooth headset which is light yet well built. The wait is over! Thousands of Glastonbury fans, tents, and crates of beer arrive for nation's biggest music festival... but will the rain stay away?